The thrill of a sustainable vegetable garden at school is connecting children directly to the food they eat. As I write this, I’m mindful of the images of devastation from Typhoon Haiyan as it created havoc in the Philippines. We are in the midst of global climate change, and storms like this are becoming more and more common. A school vegetable garden can’t solve everything, but it can re-orient our children and ourselves to growing local, healthy food. This choice can reduce our carbon footprint. There are three sustainable vegetable gardens in my life: House at Pooh Corner, The Montessori School, and our home garden. Each of these gardens includes at least one compost bin that provides nutrients for the growing flowers and vegetables. As I strive to lead the gardens at the two schools, I benefit from the garden expertise of my husband Phil. Among other things, Phil starts many of the vegetables that are planted at school. School gardens teach the connection between growing food and our plate. Children experience the vegetables in their natural environment before they get washed, cut and prepared. Students can explore the whole process: seed, planting, growing, harvesting and eating. A bonus is collecting seeds this year to plant next year. 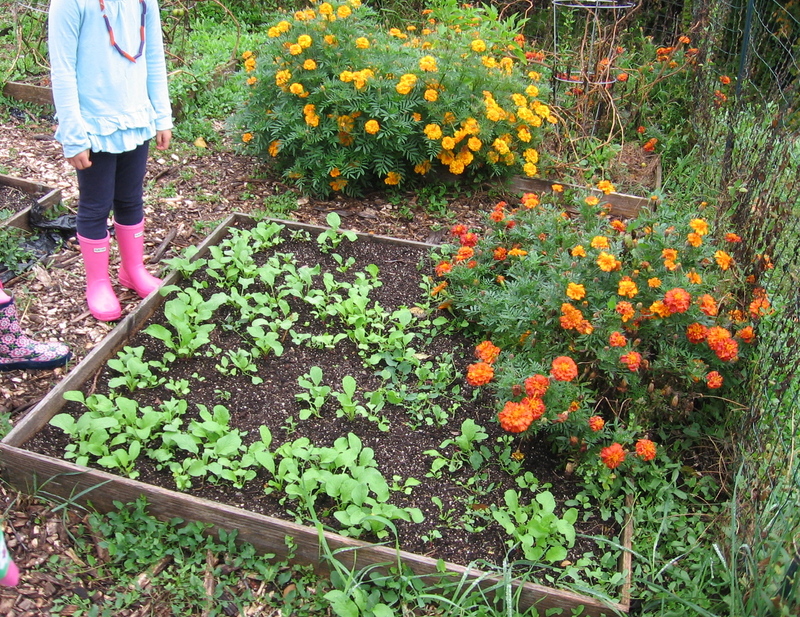 At House at Pooh Corner, a preschool, we focus on cherry tomatoes, radishes, green beans and lettuce. These are all vegetables that can be picked and eaten right away. You don’t even need to wash them (well, do wash the radishes). So the children’s experience is hand to mouth. Pick the lettuce, taste it. You’d be surprised at what a picky eater will try if they get to pick the vegetable from the plant. When there is abundance, make a salad or steam cook the green beans. At The Montessori School, in addition to common vegetables, we also have an herb garden, and have had success with strawberries, potatoes, zucchini, zinnia flowers and peppers. In both schools, the children help with the compost bin. Children collect food waste from their own snacks or lunches, and add the food to the compost bin with a layer of greens (yard waste) and browns (dried leaves or shredded paper). Months later, the children help to sift the nutritious soil, putting large pieces of compost back in the bin, and adding the soft, sifted soil to the vegetable garden. One of the joys of gardening is helping to figure out how to use the harvested food. Some uses are obvious: salad or eating raw green beans, radishes, tomatoes and peppers. Other uses educate and stretch children’s knowledge. Zucchini can be used in a recipe right away, or it can be shredded and frozen for making zucchini bread in the winter. This year at The Montessori School, we harvested an abundance of potatoes that were made into mashed potatoes and roasted potatoes. The point of a sustainable garden is to connect children to the food that they eat. 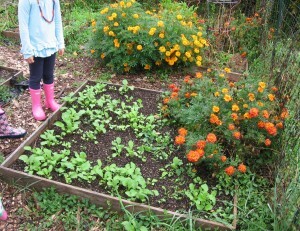 Planting, growing, harvesting, and eating create joy and wonder for a growing child. They won’t forget their experiences in the garden.